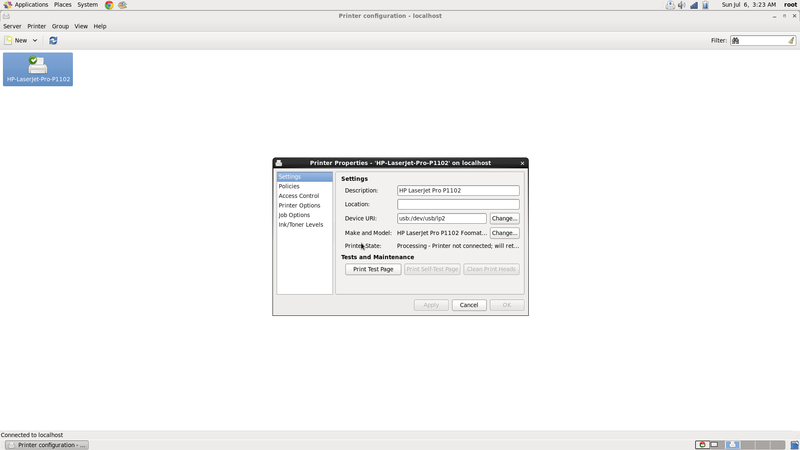 I have the system printer GUI installed on Centos 6.6. I added the printer (HP LaserJet Pro P1102). The model exists. The problem is that the GUI is asking for the Device URI which I'm not sure where to get it from. The printer is connected through the USB device. I generally use this approach when plugging in a USB based printer. Reconnect the USB printer cable, you should see some messages appearing. Press Ctrl-C to stop the logging. Note: The USB bus and device addresses change if you turn off or unplug the printer. Please re-run this command if needed. NOTE: You can also attempt to use the command line tool hp-info -i. Not the answer you're looking for? Browse other questions tagged centos usb printer or ask your own question.